Optional Single Supplement: $1170 USD (number of singles limited). Our Laos, Vietnam & Cambodia tour starts at Luang Prabang, Laos, which has a vast array of colonial era buildings that are interspersed with many interesting shops and cafes. 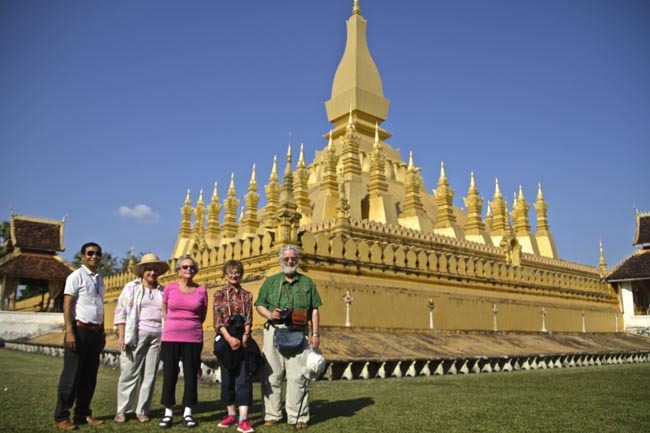 Stand face-to-face with the famous Golden Buddha while visiting the Royal Palace. 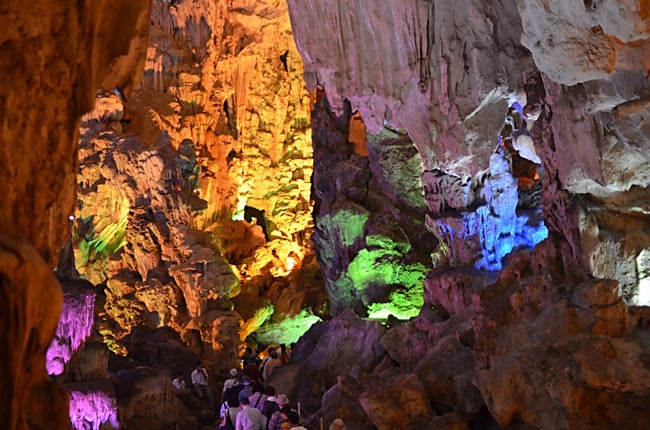 A trip down the Mekong River will give you a chance to discover the 4,000 images along the Pak Ou Cave walls. 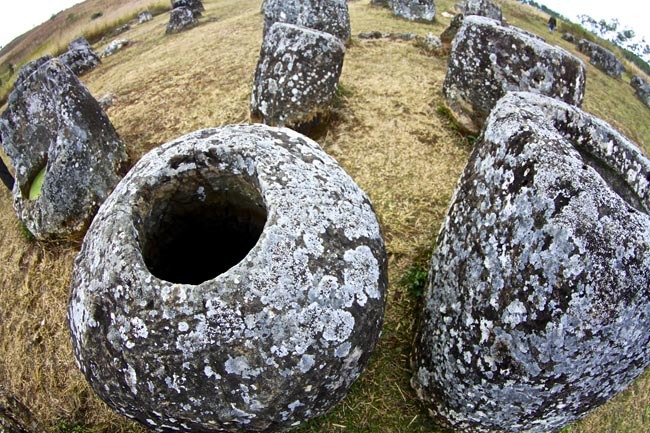 Empathize with baffled archeologists as we see hundreds of large jars strewn across Xieng Khouang's Plain of Jars. Then it's off to Vietnam where all the sights will surely overwhelm the senses; from Hanoi's breathtaking architecture to the historical richness of Ho Chi Minh City. The trip wouldn't be complete without a boat trip along the Halong Bay in the Gulf of Tonkin; cruising alongside the many rural fishermen who make their living between the many serene islands. An excursion to Cambodia's Angkor Wat is an opportunity that will not be passed-up, nor is a chance to stroll through the bustling markets of its capital, Phnom Penh. They [The Hotels] were all way beyond my expectation. Internet available in most, great breakfasts, helpful staff, comfortable beds, and hot showers. I absolutely loved the tour in Luang Prabang to the temple for the annual celebration with the monks. It was a highlight.I particulary enjoyed the excrusion to Dien Bien Phu and the experience of the dinner and evening with the Black Thai family. I enjoyed almost all the excursions very much. Standouts are Ha Long Bay, of course, Plain of Jars, Vang Vien, the cyclo ride in Hanoi,My Son, Cham Art Museum in Danang, all the sites in the three countries that explored the history of the American War in SE Asia. All of the local guides were great, all knowledgeable, friendly, energetic and left us with a positive impression of their countries. All transportation was good. Food was better than I expected. Erin, our tour leader, was ingenious in planning interesting menus with the restaurants. I must add a word about the venues though. Erin is joyful, energetic, friendly, tolerant, and full of patience. We all loved her. Erin has made it her business to know as much as possible about the local cultures. I felt that her commentaries meshed beautifully with the information given to us by the local guides. Boat trips were the best part of the trip - a good way to see the country and a nice refreshing ride on the river. Liked Ha Long Bay excursion, Mekong Delta tour, other shorter boat rides in Hue, Mekong R in Laos, Floating Village, even boat trips on the way to dinner. This was a very interesting trip. I enjoyed every day of it and learned a lot. Our guide ,Mien, for middle Vietnam was outstanding. She was a charming young woman who told us very moving human interest stories about life in her country. Her English was very understandable. I like the Adventures Abroad itineraries, costs (including evening meals, admission fees, tips for local guides and drivers etc.) and knowledgable tour leaders. I know, up front, what to expect re: costs and there are no surprises. I also value the limit on the number of participants on a tour. The level of physical ability required is clearly identified and useful. I would definitely recommend Adventures Abroad to my friends and know that I will take another tour through your company. As an overall guiding principle: I prefer interaction with locals in as authentic a way as possible. For that reason the evening with the Black Thai outside Dien Bien Phu was my favourite excursion. 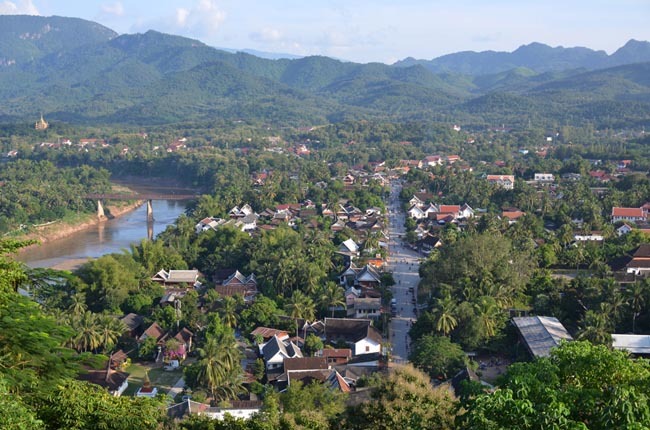 Arrive in Luang Prabang - Welcome to Laos! In the 14th century, this city was established as the royal capital by Fa Ngoum, the first monarch of Lan Xang, the "Land of a Million Elephants" (a charming and evocative nickname from times gone by. Latest figures indicate that Loas's population of wild elephants is in the range of 781- 1,202). By this time, the city had already been the seat of local kingdoms for 600 years. According to legend, the site of the town was chosen by two resident hermits and was originally known as Xieng Thong --"Copper Tree City". We have an orientation of this charming town, with its one main street lined with colonial era buildings housing shops and cafes. We have a chance to explore the town on foot and to climb to the top of Phu Si Hill. Looking directly downwards you can see that the former royal palace has a cruciform ground plan. An early departure today takes to the Mekong River for a boat journey to visit the Pak Ou Caves. The boat is long and quite large, covered, with comfortable seat cushions, life jackets and a WC. 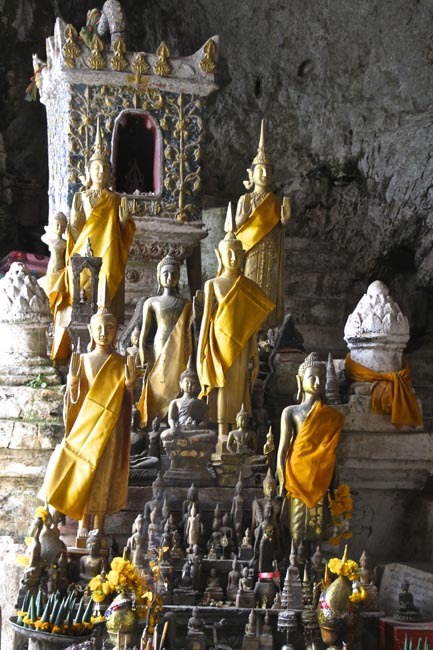 The Pak Ou Caves are two clefts in the side of a mountain stuffed with thousands of old Buddha images. 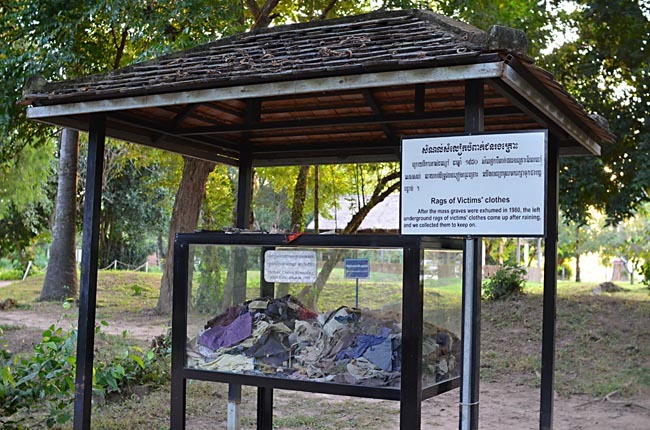 The site has long been sacred for the Lao, even prior to Buddhism, when they worshipped spirits. The lower cave has over 4,000 images, ranging from 3 inches to 9 feet tall, stuck into nooks and crannies. The upper cave's Buddha images are placed far back into the cliff, so it's handy to have a flashlight. A real highlight of a trip to the caves is the breathtaking view of the mountains, villages, and fishermen during the 2-hour boat ride. 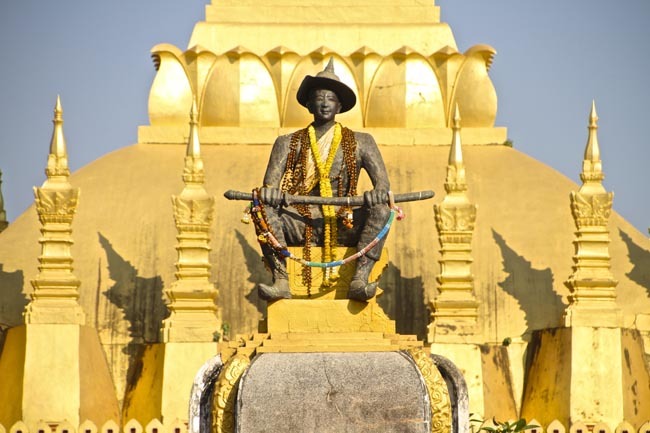 We return to Luang Prabang and visit the Royal Palace, a museum containing a collection of 15th-17th century Buddha statues including the significant Golden Buddha. The last member of the Lao royalty to live here was Sisavang Vong's son, Crown Prince Sisavang Vatthana. The private chapel is one of the most interesting wings of the palace. Here you will see the priceless gold Phra Bang Buddha in Abhayamudra (dispelling fear). It is made from 90% pure gold and is said to weigh 50 kg (110 lb). We finish with a tour of the 16th-century Wat Xieng Thong with its richly decorated wooden interior. Wat Mai is another old temple of classic Luang Prabang design with gracefully curved roofs. We see many 400 year old wooden Buddha statues at Wat Wisunalat. Today we travel by road to Xieng Khouang and the Plain of Jars. In the 18th and at the beginning of the 19th century, Xieng Khouang was the center of a kingdom of the Hmong (Meo). In 1832, it was conquered by the Vietnamese, annexing the entire region. The town of Xieng Khouang was totally destroyed during the Vietnam War. Even though it has been rebuilt in 1975, the name Xieng Khouang is now primarily used in reference to the province of the same name. 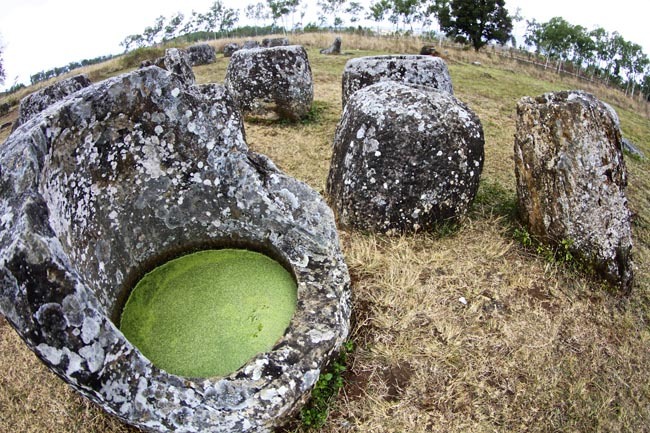 The highlight of our visit here is the "Plain of Jars." Scattered over the plain are hundreds of enormous limestone jars, each about 1 to 2.5 metres high, with a diameter of about 1 meter. There is still no explanation as to how the clay jars found their way onto the plain, nor what purpose they served. Archaeologists have come up with the wildest theories, among them a claim declaring them brewery cauldrons. More likely, the jars are enormous urns. Many jars were destroyed or damaged during the Vietnam War, when American planes bombed positions of the communist Pathet Lao. 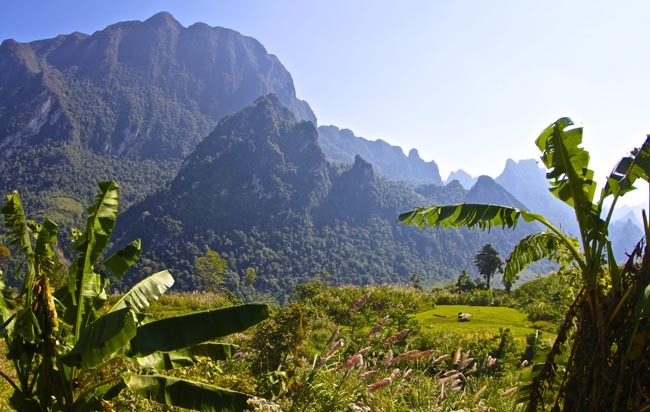 Today we travel by road to Vang Vieng, a small village nestled in a scenic bend in the Nam Song River and surrounded by breathtaking limestone scenery. 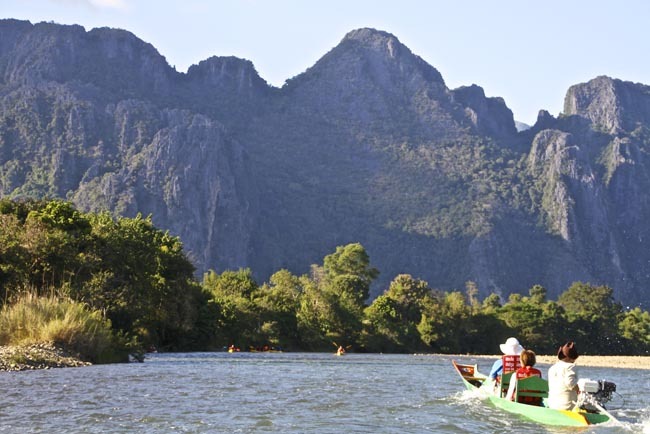 This is rapidly becoming Laos's premier destination for eco-tourism. The outcrops have inspired many Lao legends and stories in Lao literature and are known as "Phou Suan Mon Nang Eua", meaning "Silk Tree Garden Mountains of the Princess". The area also contains an extensive network of caves some of which are outlets for underground streams. The latter part of our drive is truly spectacular -- limestone cliffs and sheer drops. 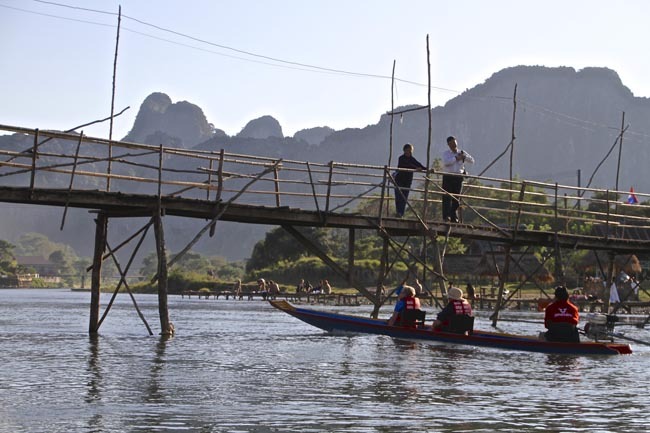 About 20 kms before Vang Vieng, we'll stop at a bridge with a lovely view of karsts. There's also an attractive wat immediately before the bridge. Today we travel by road to Viangchan (Vientiane), the capital of Laos. Time-permitting we may be able to see a bit of Viangchan today upon arrival. Today we fly from Viangchan to Hanoi. Flight time-permitting, we may have some time to see more of Viangchan before our flight. Hanoi is a lovely city with lakes, fine boulevards and flourishing parks, as well as having a public centre that is an architectural museum piece. 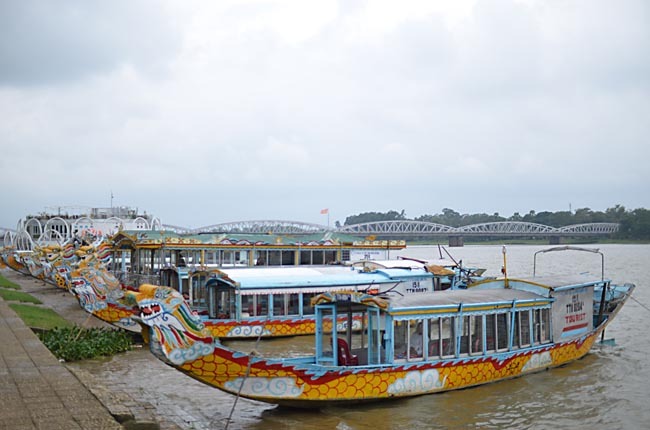 Hanoi is situated on the right bank of the Red River (Song Hong) which is spanned by two bridges, the old Long Bien Bridge and the new Chuong Duong bridge. 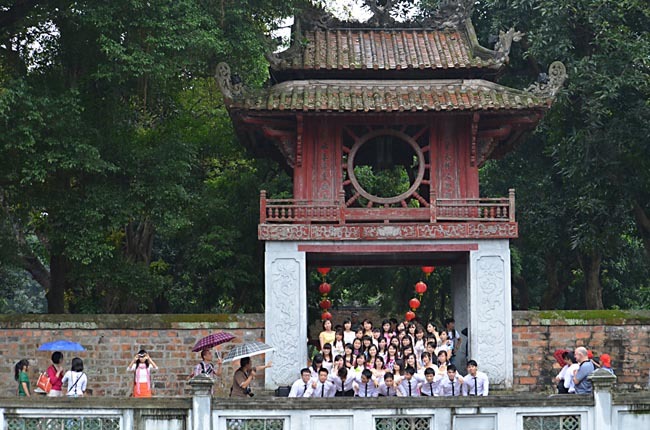 In the centre of downtown Hanoi is Hoan Kiem Lake (also called the Lake of the Restored Sword or the Small Lake.) Emperor Le Thai To (1428-1433), following a momentous victory against an army of invading Ming Chinese, was sailing on the lake when a golden turtle snapped at (and broke off) the tip of his sword, so signifying that its work was done. There is a modest tower (the Tortoise Tower) commemorating the event on an islet in the southern part of the lake. In fact, the lake does contain large turtles; one captured in 1968 was reputed to have weighed 250 kg (552 pounds). The park that surrounds the lake is used by the residents of the city every morning for jogging and tai chi (Chinese shadow boxing) and is regarded by locals as one of the city's beauty spots. When the French arrived in Hanoi at the end of the 19th century, the lake was an unhealthy lagoon surrounded by so many huts that it was impossible to see the shore. Today we have a full day of sightseeing, starting with the Mausoleum of Ho Chi Minh, a site of pilgrimage (the building has been closed to visitors of late; probably an outside viewing only). The building was constructed from materials gathered from all over Vietnam. Modeled closely on Lenin's Mausoleum, Ho Chi Minh lies at rest in this Vietnamese version. We continue to the house on stilts, where Ho Chi Minh lived and worked from 1958 to 1969. Its construction and decor illustrates the importance of simplicity and modesty to this Vietnamese revolutionary. The building is elegantly crafted with lacquered and polished wood, following the model of a traditional communal house on stilts. We continue to the new Ethnology Museum, one of Vietnam's finest. Dedicated to the ethnic minorities of Vietnam, this museum provides educational displays and descriptions and provides a real insight to peoples found primarily in the high country. 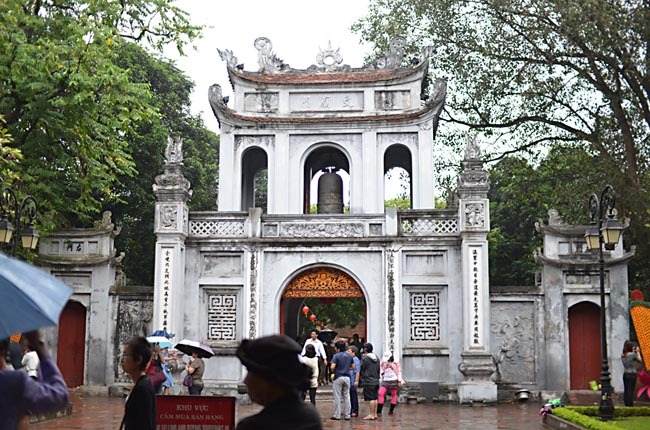 Next is the Temple of Literature, the site of the first national university dating back to 1076 and one of Hanoi's best-preserved ancient sites. We finish with the Hoa Lo Prison Museum, known to American prisoners of war as the Hanoi Hilton. This museum was a prison used by the French colonists in Vietnam for political prisoners and later by North Vietnam for prisoners of war during the American/Vietnam War. innumerable white sandy beaches and grottoes created by wind and waves. 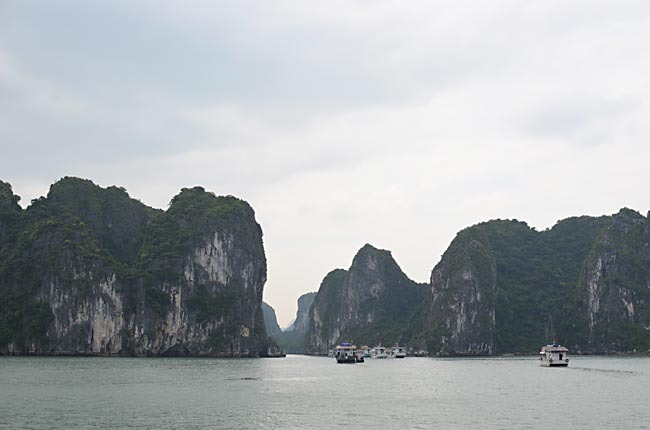 The name Halong means "where the dragon descends into the sea". Legend has it that the islands of Halong Bay were created by a great dragon who lived in the mountains. 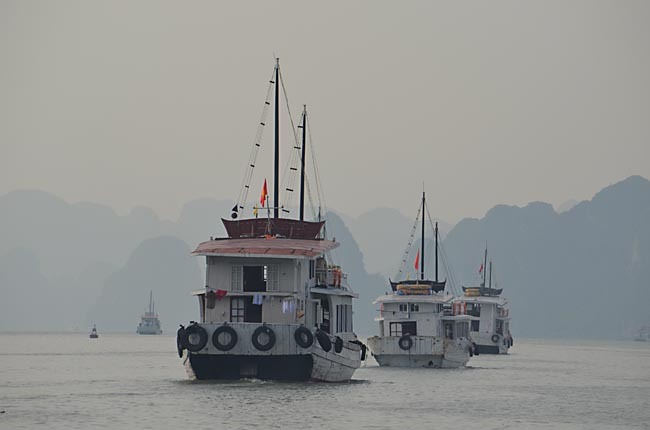 On arrival at Halong Bay we will board our Huong Hai Junk cruise and enjoy a welcome drink. The Huong Hai ('Ocean Flavours') junks are unique, 'antique' (replica) accommodations that are scrupulously clean, fully-crewed and comfortable. Our junk/s are large boats with private bath, air conditioning and fan, and plenty of deck space. An onboard chef prepares delicious, local seafood dishes (non-seafood dishes available). After lunch on board we will cruise among the islands, stopping at a couple that have interesting cave features (involving stairs). We enjoy sunset and then dinner on board. Fishermen at Halong mount fan-shaped Chinese junk sails on their boats, the same sort of sails once deployed by pirates in these waters. Junks have been used for centuries by the Chinese, Japanese and Javanese for fishing and transportation, and often as living quarters; a junk commonly includes a deck, high masts, and several cotton sails. Halong is one of the last places where junk sails are still handmade by families of sail makers. Coarse cotton panels are sewn together with silk thread -- every seam sewn by hand. To discourage rot and mildew, the completed sail is dipped in a liquid that comes from a beetroot-like member of the yam family. The sail is dipped and dried three or four times; a process that gives its dark red-tan colour. Early this morning, after breakfast on board, we cruise to visit Hang Luon Cave by small bamboo boat. We check out at around 10 am, enjoy brunch on board before disembarking and departing for Hanoi at around noon. 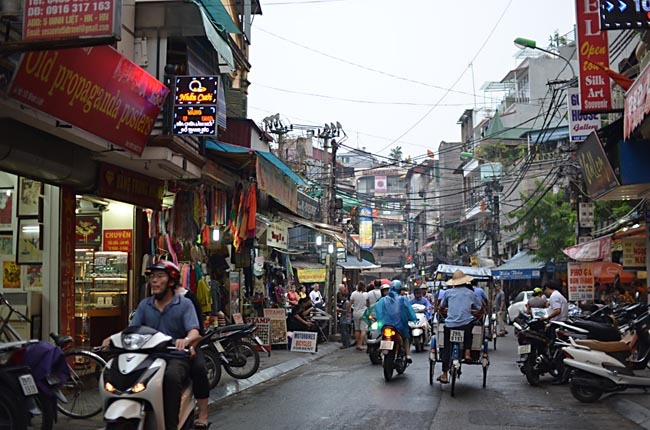 Upon arrival we'll visit Hanoi's Old Quarter, also known as the 'Quarter of 36 Streets', where we enjoy a leisurely walking tour. This evening we will enjoy a (+/- one hour) water puppet show. 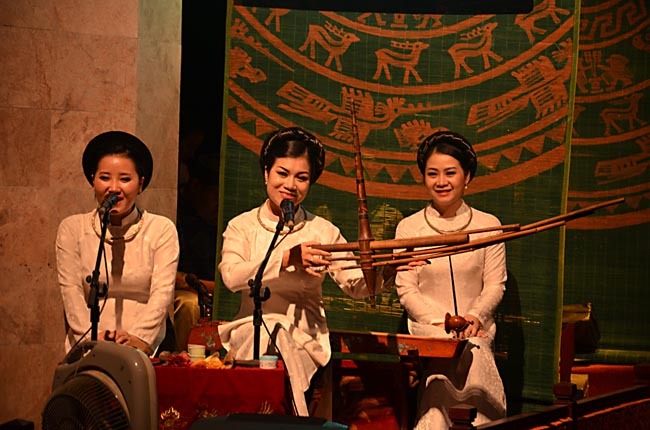 This is a fantastic art form unique to Vietnam and derives from the Red River Delta area. Today we fly from Hanoi to Dien Bien Phu, in the heart-shaped Muong Thanh Valley near the Lao border, one of the remotest parts of Vietnam. The valley is surrounded by steep, heavily-forested hills inhabited by Hill Tribes. Though it is difficult to plan in a formalized way, we hope to have some face-to-face encounters with the numerous ethnic groups in the area and learn about their distinctive cultures. Dien Bien Phu was the site of that rarest of military events, a battle that can be called truly decisive. Here, in 1954, Viet Minh forces overran the beleaguered French garrison after a 57-day siege, forcing the French government to finally abandon its attempts to re-establish colonial control of Indochina. 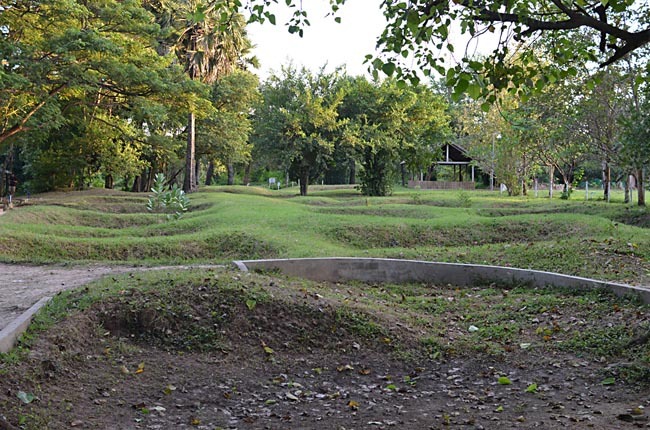 Our area sightseeing includes the DBP battle area and a visit to the DBP Army Museum and A1 Hill. Dien Bien Phu now bears few scars of its past except for the occasional rusty tank. While in Dien Bien Phu, we will explore the surrounding area with plenty of beautiful landscapes, waterfalls, terraced rice fields, and indigenous villages. The Hill Tribes living around the area of Dien Bien Phu make up 70% of the region's population, and the ethnic minority groups include the Black Thai, Nung, Meo, Hmong, and others. We will have an opportunity to meet the local people and, hopefully, visit a village to witness the way of life in this rapidly changing part of Vietnam. Later today we fly to Da Nang via Hanoi and continue by road to Hoi An. Da Nang is situated on a peninsula at the point where the Han River flows into the South China Sea. We pass through the nearby Marble Mountains; five limestone peaks with marble outcrops known for their beauty and their caves. At the foot of Marble Mountain, an important religious site for the Chams, you can see many artisans crafting fine marble objects. Our destination is one of the most charming towns in Vietnam -- Hoi An. The ancient town of Hoi An (formerly Faifo) lies 32 km (20 miles) south of Da Nang on the banks of the Thu Bon River. Today we will be able to soak in the atmosphere of this small town (a World Heritage Site) on a walking tour. 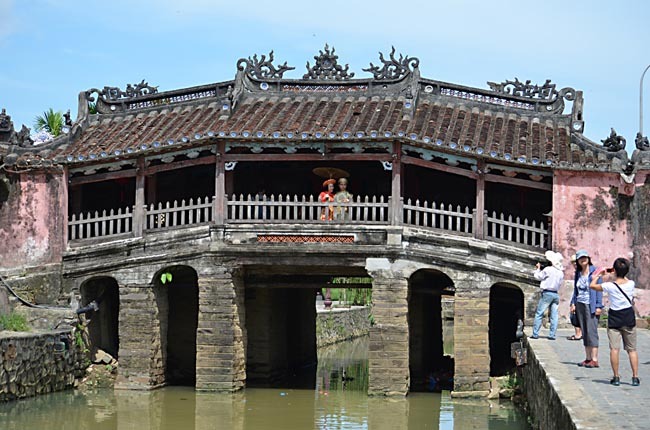 The unique architecture, the temples, the market will make Hoi An one of the highlights of your trip. The Japanese Covered Bridge was built in the 16th century, perhaps even earlier. On its north side there is a pagoda, Japanese in style, which protects sailors. Its popular name reflects a long-standing belief that is was built by the Japanese, although no documentary evidence exists to support this. 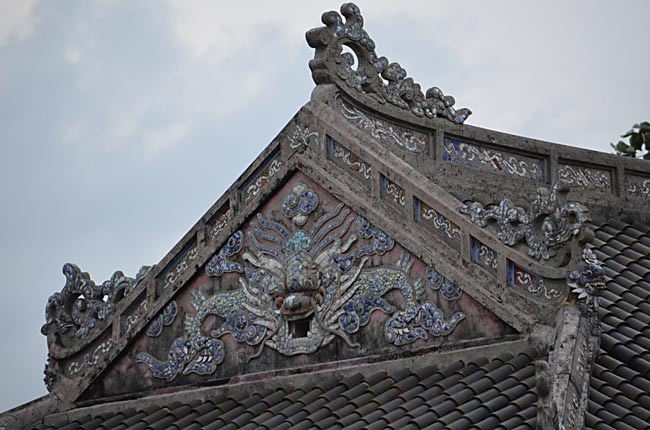 At the Tran Family Temple we will see the fusion between both the Chinese and Japanese styles. This temple has survived for 15 generations. 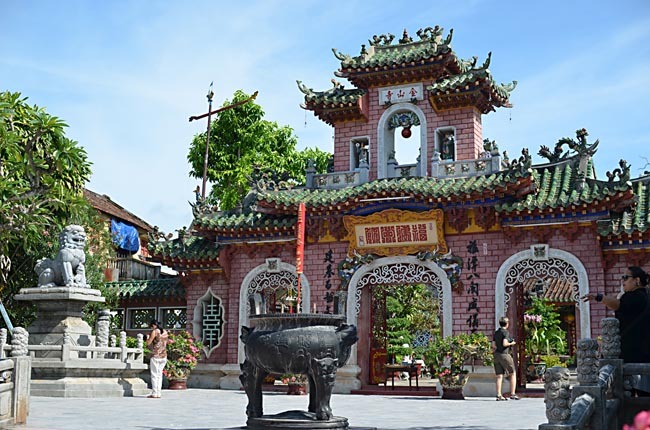 While in Hoi An, we'll also enjoy a boat trip on the river and visit the Chinese Assembly Hall and Central Market. This morning we visit the World Heritage Site of My Son ("mee-sohn"), a large complex of religious relics that comprises more than 70 architectural works from the obscure Cham Dynasty (2nd-15th century). The Chams were "Indianised" during commercial trading relations and adopted Hinduism (which can clearly be seen in the Temple designs). 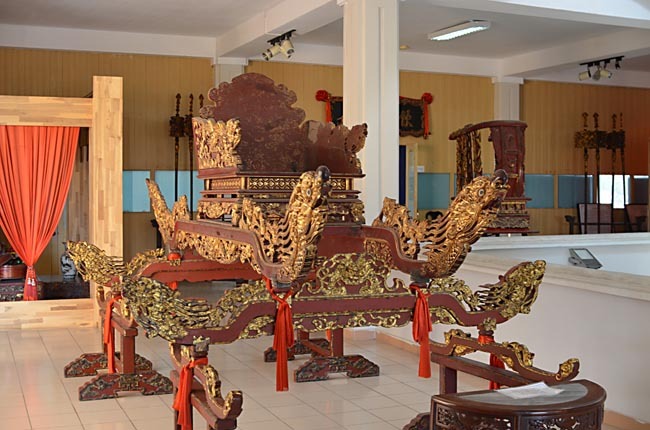 My Son served as a intellectual and religious centre and is a must visit as one of Vietnam's most important Cham Sites. The forested, mountain setting and general peacefulness of this little visited site make this an excellent excursion. Return to Hoi An with the balance of the day at leisure. Today we travel to Hue via Da Nang where we visit the Cham Museum which houses the largest display of Cham art anywhere in the world. Shortly after departure from Da Nang we will pass through the Truong Son Mountains, the former border between North Vietnam and South Vietnam. Hai Van Pass, or literally "Pass of the Ocean Clouds," offers spectacular scenery. 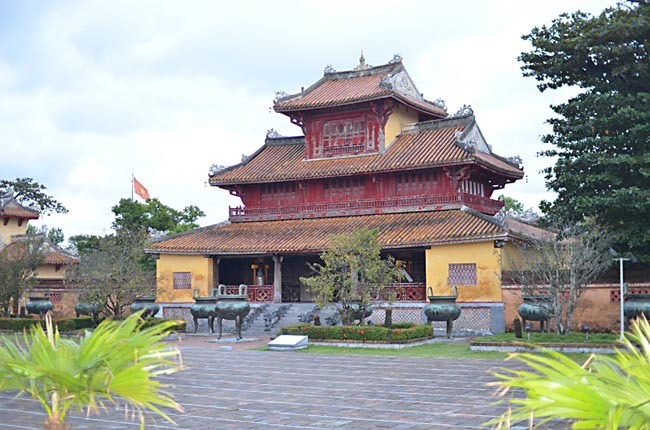 Hue was the capital of the old Nguyen dynasty and traditionally one of Vietnam's cultural, religious and educational centers. 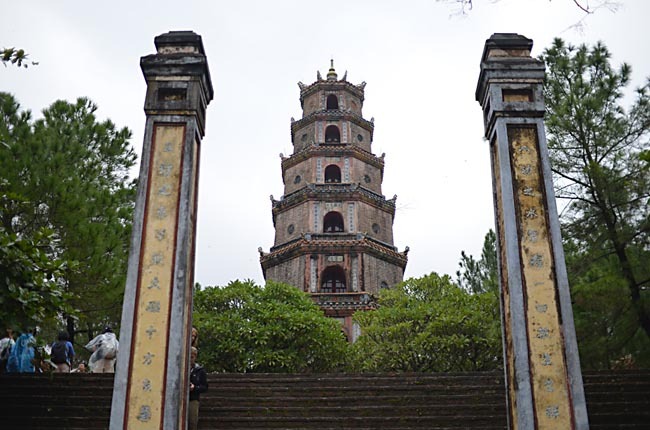 Here there are splendid tombs of the emperors, several stunning pagodas and the citadel that houses the forbidden Purple City, situated on the banks of the Perfume River. 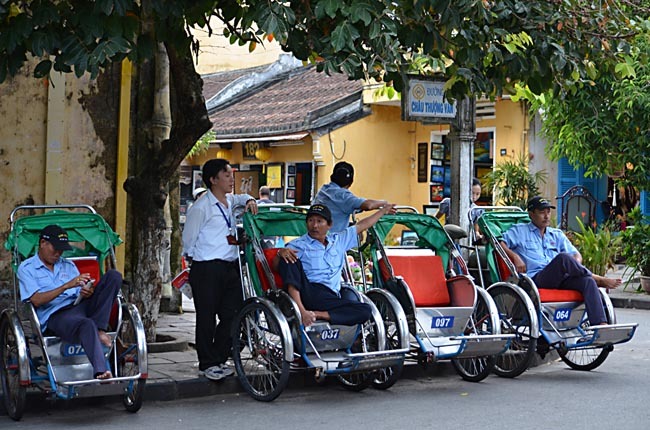 While in Hue, we will enjoy a "cyclo" ride through the old city and market. 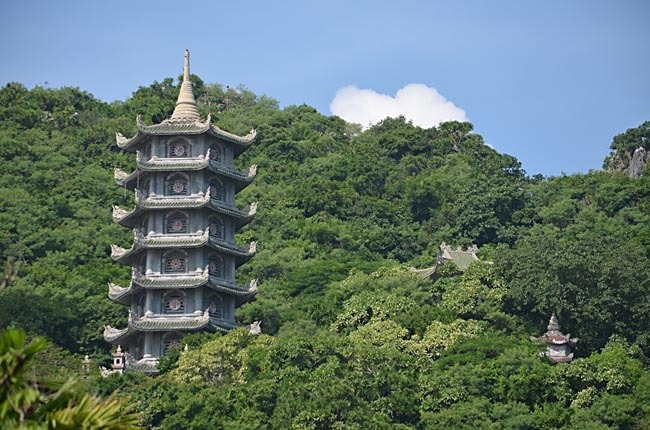 We begin our day by motorised boat down the Perfume River to visit the delightful Thien Mu Pagoda, considered to be the finest pagoda in Hue. 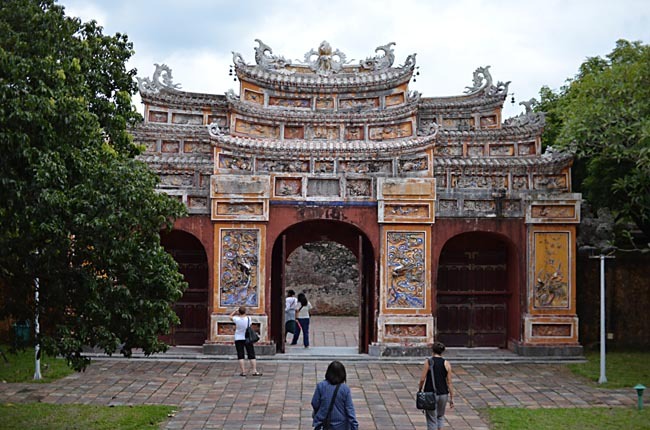 It was built in 1601 after an old woman appeared to Nguyen Hoang, the governor of Hue, and said that the site had supernatural significance. This afternoon we tour the Citadel, a fortress surrounded by a moat that has a six-mile perimeter. At the Forbidden Purple City we can see the remains of the former home of the emperors. The Imperial City is built on the same principles as the Forbidden City in Beijing. 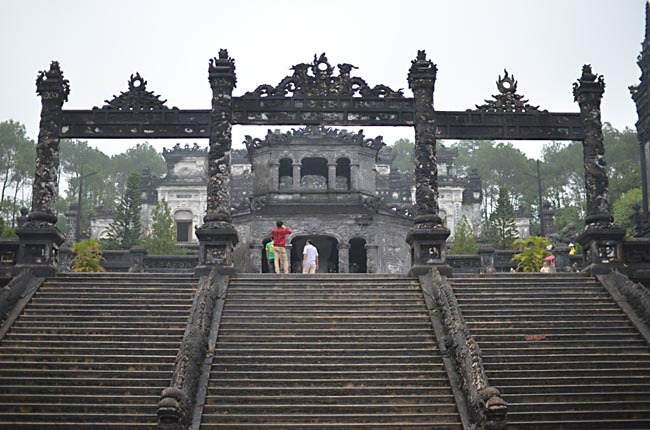 It is enclosed by thick outer walls (Kinh Thanh) of 23-33 feet, along with moats, canals and towers. There are ten gates, which pierce the four walls of the citadel, although many are in poor condition. The city has not only been damaged by war, but also by natural disasters such as floods, which inundated the city in the mid-nineteenth century to a depth of several feet. The complex has undergone partial restoration with the aid of UNESCO. This evening we will enjoy a special, private dinner in a beautiful, restored royal home in Hue. The home is now owned by descendants of the Hue royal family. 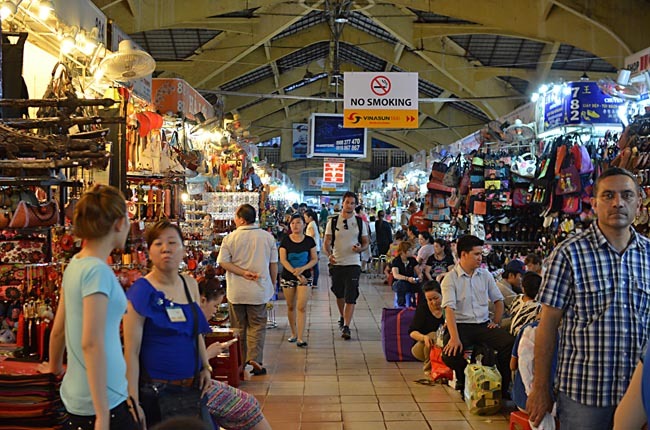 Today we fly from Hue to Saigon (Ho Chi Minh City), the business and tourist centre of Vietnam. This afternoon we visit some of the city's highlights, including the Reunification Hall, formerly the site of Norodom Palace, the residence of the French governor-general of Indochina. On 30 April 1975, NVA tanks smashed down the first gates and took control of Saigon. We then proceed to Cholon, or Chinatown, an area inhabited by Vietnamese of Chinese origin. This area is one of the most vibrant in the city. 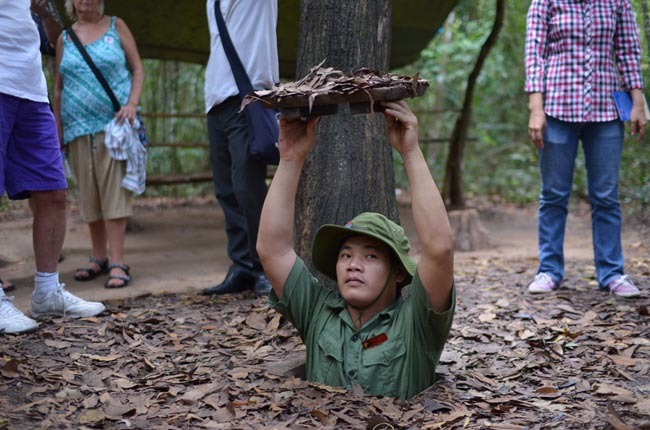 Today we travel outside of Saigon to the Cu Chi Tunnels. The tunnels were dug with simple tools and bare hands during the French occupation in the 1940s, and further expanded during the Vietnam War in the 1960s to provide refuge and a defensive advantage over the American soldiers. 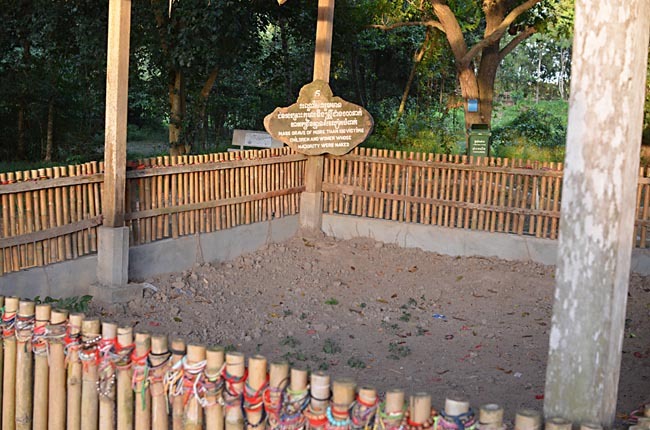 Despite all the bombings in their town, the Cu Chi people were able to continue their lives beneath the soil, where they slept, ate, planned attacks, healed their sick, and taught their young. Some even wed and gave birth underground, but over 10,000 lost their lives here. A well-defined walking track loops around the area, with things to see spaced at regular intervals, including examples of how people lived and what they ate. There are sample sections of tunnel which visitors can crawl through (not recommended for the claustrophobic), examples of traps used during the war, and the remnants of bomb craters. From here we will continue on to the War Remnants Museum (formerly the Exhibition House for Crimes of War and Aggression). The exhibits may be one-sided with many exhibits containing a heavy dose of anti-American propaganda, but they do graphically portray the horrors of the war. On our way to the Delta, we will stop at one of the many Cao Dai temples. * This hybrid religion took root in southern Vietnam during the 1920's after Ngo Van Chieu, a civil servant, was visited by 'Cao Dai' or the 'Supreme Being'. The Cao Dai later told Ngo in a seance that he was to be symbolized by a giant eye. Being a humanist religion, it quickly gained support of a large following of dispossessed peasants. 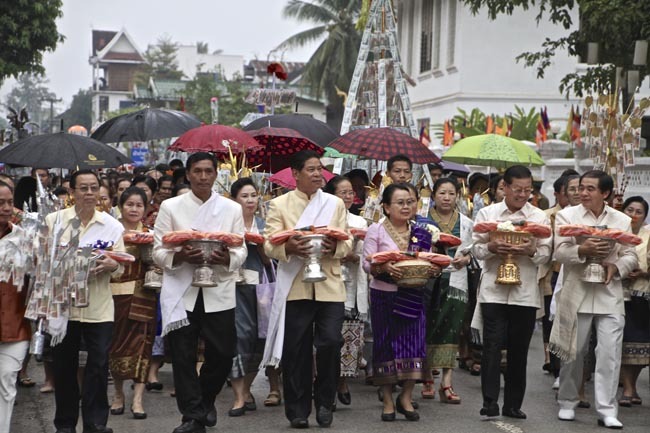 Today there is thought to be about 2,000,000 adherents and 1,000 Cao Dai temples. A four-hour drive south takes us to the fertile delta of the meandering Mekong River, the southernmost region of Vietnam. 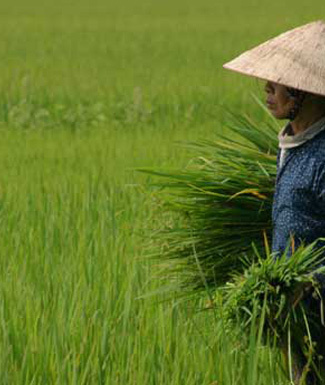 Often referred to as the rice bowl of Vietnam, producing three crops of rice per year, the fertile Mekong Delta is also famous for its tropical fruits and flowers. The Delta area is the end of a 4500 km / 2,812 mi journey the Mekong River makes after travelling through six countries. Traditional transportation in the Delta is by boat, via a vast network of canals and channels. 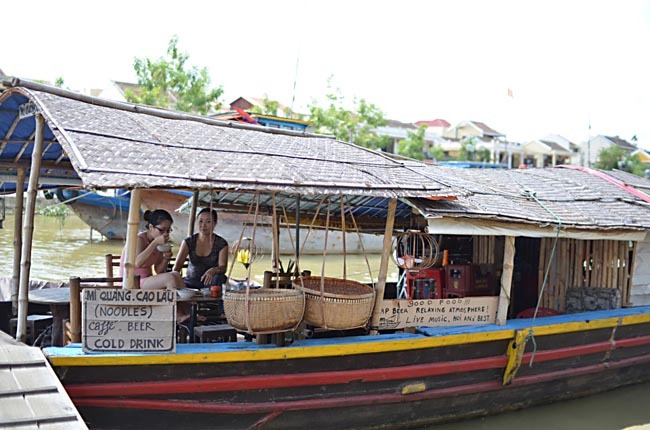 Boating along these canals and visiting the floating markets is a fascinating experience. * Please pack an overnight for the trip to the Mekong Delta. Large baggage will be securely stored in Saigon. 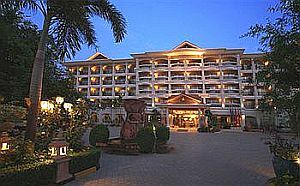 Overnight in hotel in Cantho region (Mekong Delta). 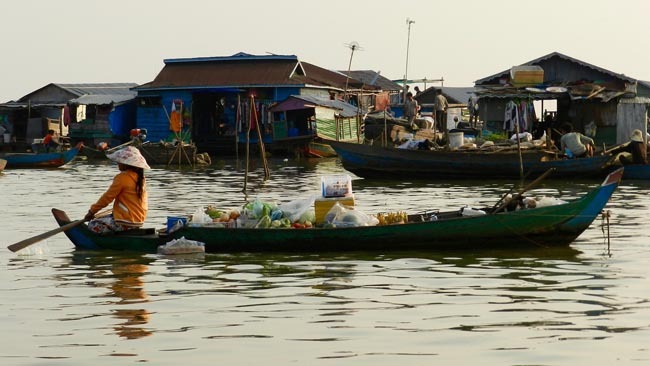 Early this morning we will have a covered boat ride on the delta where we can have a candid glimpse into the lives of the local people selling, buying, and exchanging goods from their boats. We meet our bus (at a different point from where we left it) for our drive back to Saigon. This afternoon we may accomplished Saigon area sightseeing not accomplished earlier due to flight times. At some point during out tour we will drive past the Notre Dame Cathedral and adjacent Post Office. Both of these buildings were constructed by the French in the 1880s and display architectural characteristics typical of that time period. Today we fly from Saigon to Phnom Penh, the capital and largest city in Cambodia. Engineered by the French, Phnom Penh was once filled with beautiful tree-lined streets and colonial mansions. Today many of the old buildings exist, although they are in a severe state of disrepair. Depending on the time of our arrival, we may accomplish some of the sightseeing as described tomorrow, today upon arrival. 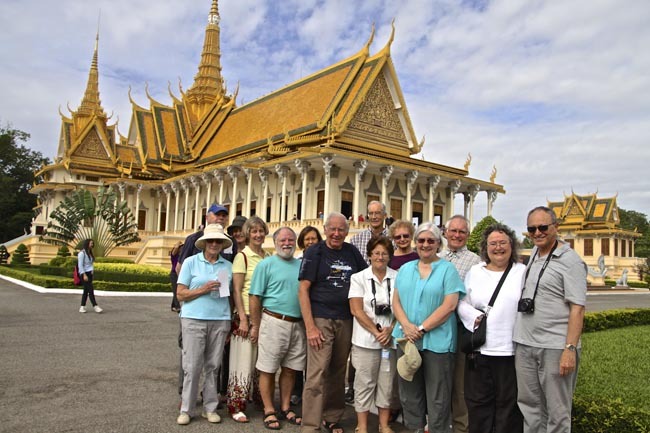 Today we tour Phnom Penh and its surroundings. 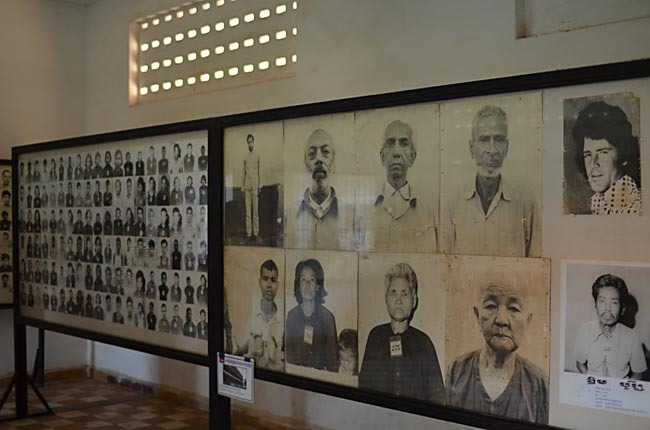 We begin with a visit to the infamous Tuol Sleng Prison, now a museum illustrating the atrocities committed by Pol Pot during the 1970s, and the nearby Choeung Ek, aka the "Killing Fields." 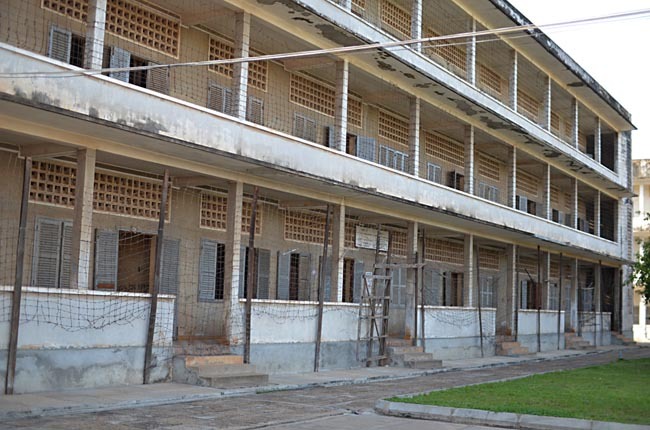 The buildings at Tuol Sleng are preserved as they were left when the Khmer Rouge were driven out in 1979. The regime kept extensive records, including thousands of photographs. Several rooms of the museum are now lined, floor to ceiling, with black and white photographs of some of the estimated 20,000 prisoners who passed through the prison. 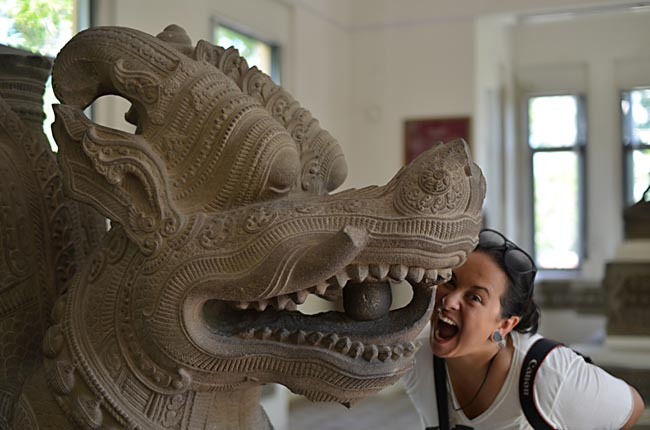 Back in town, we visit the National Museum, which houses one of the world's largest collections of Khmer art, including sculpture, ceramics, bronzes, and ethnographic objects. 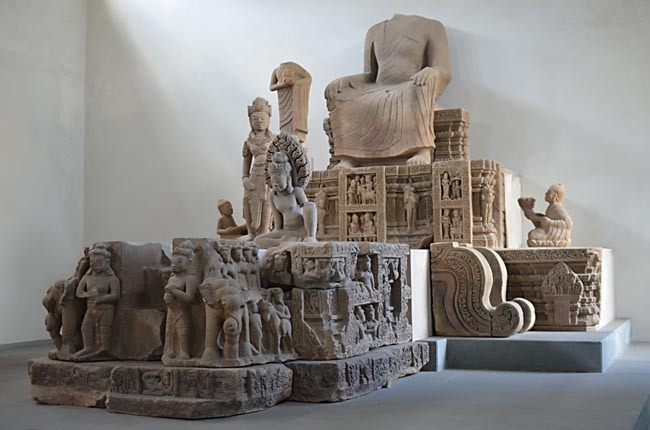 The museum's collection includes over 14,000 items, from prehistoric times to periods before, during, and after the Khmer Empire, which at its height stretched from Thailand, across present-day Cambodia, to southern Vietnam. 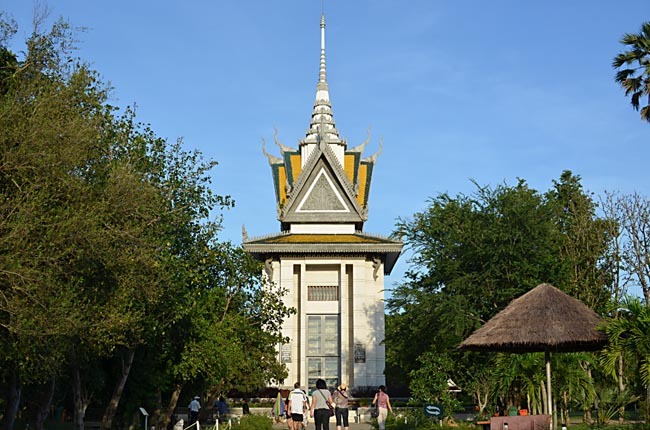 The Museum buildings, inspired by Khmer temple architecture, were constructed between 1917 and 1924. 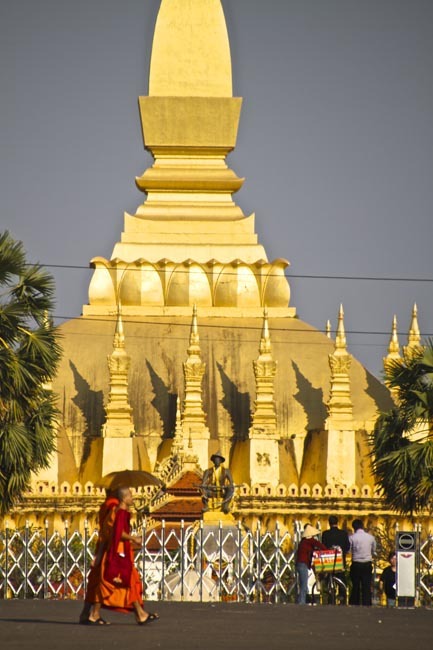 We then walk the short distance to the Royal Palace and Silver Pagoda. We also stop in at Wat Phnom, a magnificent temple overlooking the town, said to be the spot whereupon the city was originally founded. 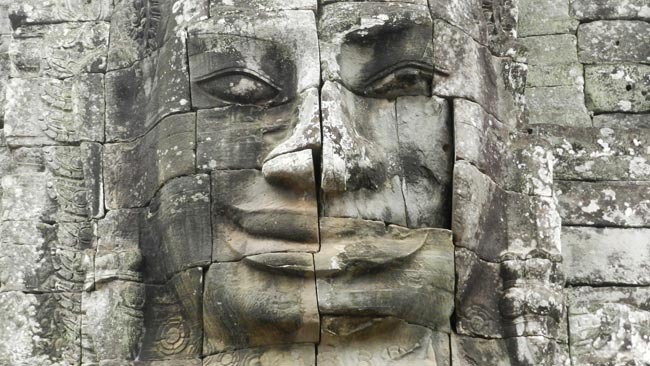 Today we fly to Siem Reap, gateway for Angkor Wat/Angkor Thom. Later we wander the magnificent grounds of the splendidly preserved 12th Century temple of Angkor Wat. 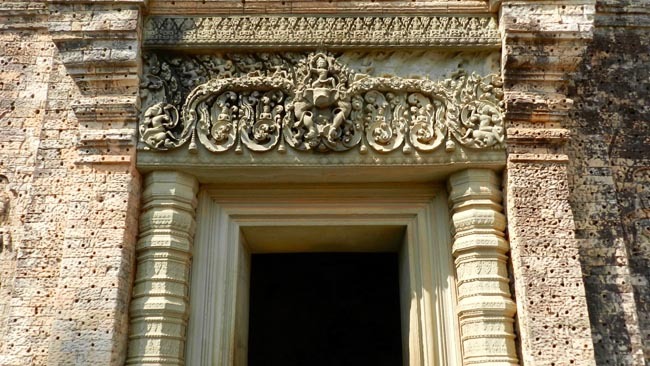 * Considered the best example of ancient Khmer architecture, it is the largest and most impressive of all Cambodian monuments and generally regarded as one of the finest religious structures in the world. We will also be visiting the South Gate of Angkor Thom, Bayon Temple, Baphuon, the Elephant Terrace and the Terrace of the Leper King. 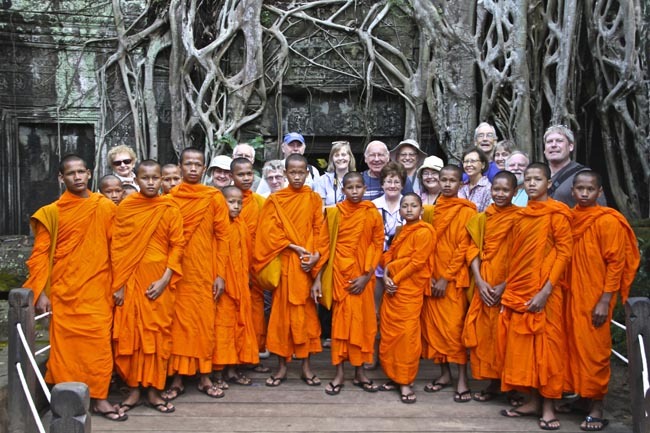 * NOTE: The order of Siem Reap sightseeing may vary at the discretion of your Tour Leader. Today is dedicated to seeing the remaining highlights of the Petit Circuit -- Angkor Thom (Bayon), with its haunting images of the God-like Avalokitesvara and its magnificent murals, and Sras Srang (Pool of Ablutions), Ta Keo (the first Khmer temple built entirely of sandstone), and Ta Prohm, in its natural overgrown setting. 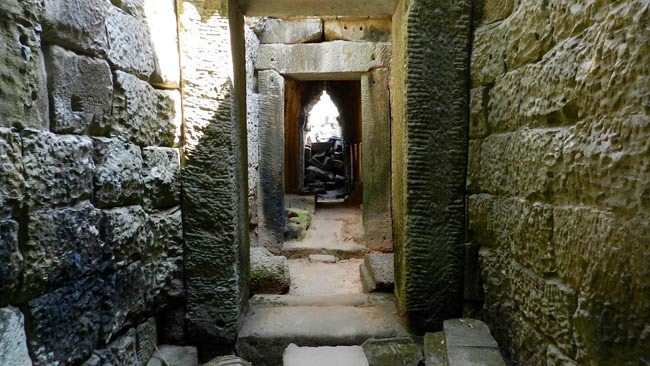 We will also see much of the Grand Circuit, including the great temple of Preah Khan and the brick sanctuaries of Pre Rup. It is not hard to imagine how this vast complex, covering several square kilometers, with carefully engineered canals and reservoirs to control flood waters and survive droughts, was once (by some estimates), the largest city in the world, housing as many as one million inhabitants. Today we visit some temples a little farther afield, including the exquisitely carved Banteay Srei. 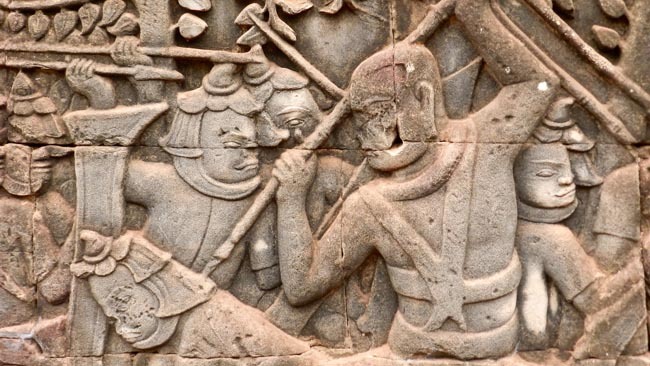 Banteay Srei is something of an anomaly. It wasn't built by a king, but rather a spiritual teacher, Yajnavaraha, the Brahman of King Jayavarman V, in AD 967. At that time it was called Tribhuvana Mahesvara, and stood in a town called Isvarapura. 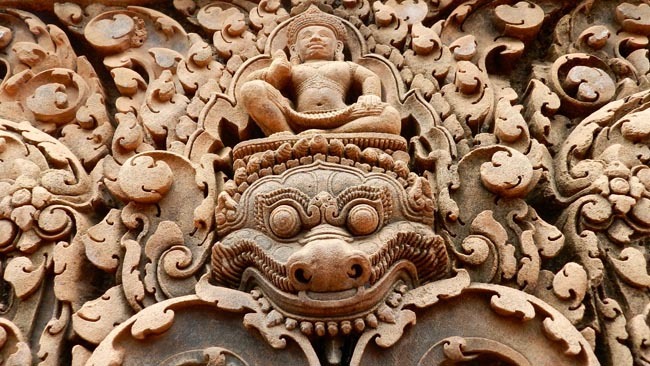 The name Banteay Srei means the "Citadel of Women", and is one of the first temples to be restored by the French. 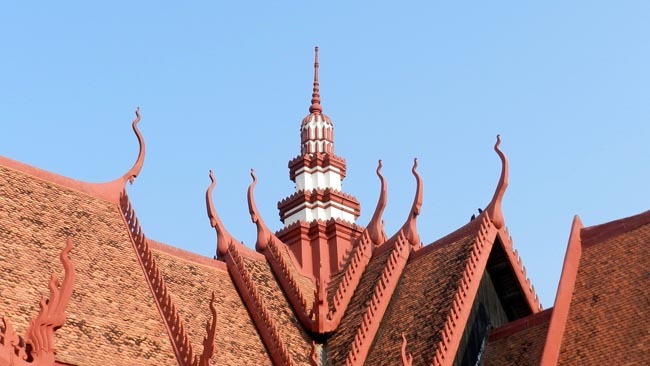 A 10-minute walk from town on a quiet street, the Mouang Loung is adorned with traditional Lao temple-style roofs. The ...	are clean, with parquet floors and marble-tiled bathrooms (all with tubs). Street-side rooms have balconies. There's an open-air Lao restaurant in the back, and just above it is an enormous balcony reserved for Baci ceremonies. 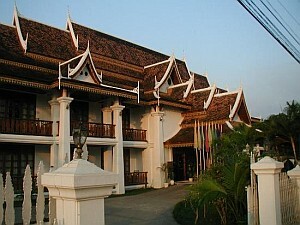 Mouang Luang has the distinction of being one of the only hotels in town with a pool. 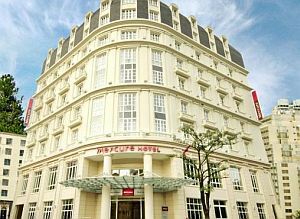 Located opposite Hanoi Central Railway Station, Mercure Hanoi La Gare is an inviting oasis in the heart of the bustling ...	centre. Situated close to the Old Quarter, this hotel features modern design and facilities, a French brasserie, internal courtyard and gym. The Hoi An Hotel offers 160 international-standard rooms, restaurant, bar, garden café, outdoor swimming pool, fitness center, jacuzzi pool, sauna, ...	bath, beauty salon, laundry service, mail services, money exchange, souvenir shop and art gallery. All rooms feature: telephone, air-conditioning, bathroom with bathtub and shower, mini bar, satellite TV, hair dryer, bathroom amenities, in room safety box. 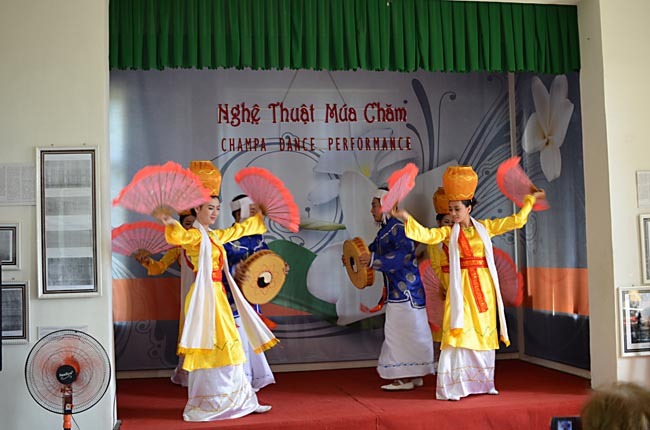 Festival Hotel is rightly situated in the very heart of of Hue city, in close reach to to the relics ...	the Old Charming citadel with easy access to the Royal Citadel, Antique museum, and other beautiful landscapes and tourist attractions. 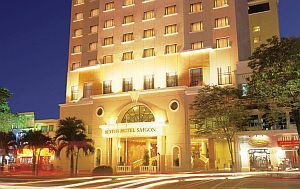 Located right in the heart of vibrant Ho Chi Minh City, the Duxton Saigon is a luxury 4* boutique hotel ...	a refined and relaxing environment. As well as a range of deluxe rooms, executive rooms and suites, the hotel also has a restaurant, bar, gaming centre, gymnasium, swimming pool, spa and business centre. 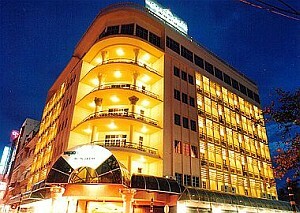 Holiday Villa Hotel is a 3-star international hotel, built to reflect the best of French colonial design and style. The ...	has 74 well-appointed guestrooms and suites. Holiday Villa is strategically located on the main business street, within the vicinity of shopping area and just minutes’ walk to famous Central Market (Psah Thmei). Phnom Penh International Airport can be reached within fifteen minutes drive. 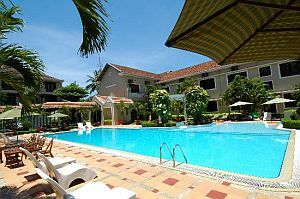 This Siem Reap Hotel has 150 elegantly designed and well-furnished guest rooms, each with balcony, provide an atmosphere of tranquil ...	You will enjoy the panoramic view of Siem Reap City. Breakfast and dinner (at local restaurants and some hotels) are included daily; all meals on junk cruise. All transport, accommodation, sightseeing and entrance fees for sites noted as 'visited' in the detailed itinerary. Gratuities for drivers, junk crew, restaurant staff, porters, local guides. Airport transfers for land & air customers and for early arriving / late departing land & air customers who book their extra hotel nights through us. International airfare to/from the tour. Tour Leader gratuities, most lunches, drinks, personal items (phone, laundry, etc), domestic and international (if applicable) air taxes, visa fees, and any excursions referenced as 'optional'. Airport transfers for Land Only customers. Optional trip cancellation insurance. Our post-reservation trip notes offer further guidance on shopping, not included meals, visas and locally paid departure taxes. 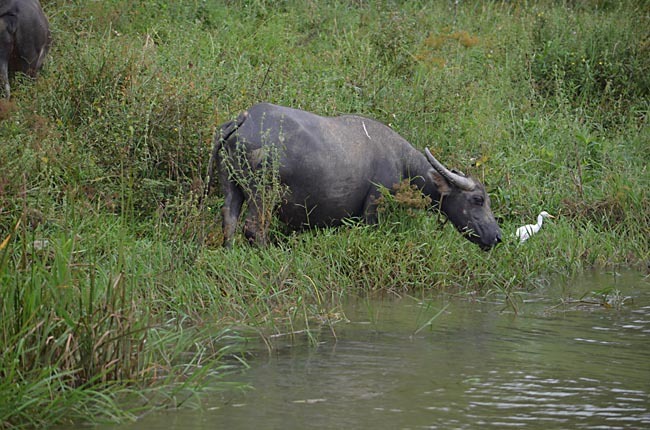 Our tours in SE Asia operate during the cooler, drier time of year, Nov-Apr. That said, however, the entire region experiences a warm-hot tropical climate with humidity and a chance of rain showers at any time. Inland regions can experience extreme heat, especially Feb-Apr, when it is also very dry and landscapes are brown. Coastal regions-Central Vietnam, Halong Bay-are cooled by sea breezes. Hanoi, Northern Vietnam & Plain of Jars (Laos) can be downright cold and damp, especially late Nov-Jan. Overall you should prepare for warm, sticky weather with the possibility of rain and some chilly nights / mornings in a few locales. Land transport throughout will be by private air-conditioned bus. Most of the driving days are not long, usually no more than four hours. Road conditions are generally not good and progress can be slow. Boats are used at various points in the itinerary, and vary from converted trawlers to small riverboats. Internal flights via scheduled regional carriers. The tour is not strenuous though it is busy; you must be steady on your feet and be able to endure some heat and long days. We have numerous walking tours and visit several sites that are LARGE with steps and uneven surfaces. Porters are available at hotels but you must be able to manage with your baggage at airports. 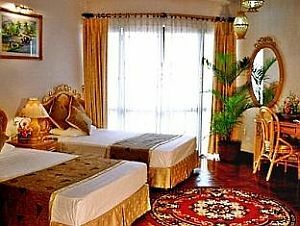 Hotels used on tour are modern, comfortable, well-located, air-conditioned, 3&4 star properties with en suite bath / toilet (hotel at Dien BIen Phu may be of a simpler standard). Single rooms are limited and possibly smaller than twins. Laundry facilities are available at most hotels for a reasonable price. Safe deposit boxes are available in most hotels either free or for a nominal fee. Most hotel rooms are well equipped and likely include hairdryers and irons, minibar fridge, TV. All are air-conditioned. Most hotels provide complimentary purified drinking water. Some hotels have swimming pools. HUONG HAI JUNK: The Huong Hai junks are unique, `antique' (replica) accommodations that are scrupulously clean, fully-crewed and comfortable. Our junk/s are large and luxurious boats with private bath, air conditioning and fan, and plenty of deck space.